Bleach Wallpaper: Summer Lovin . :[Dedicated To My Twin Sister: thingperson ]:. 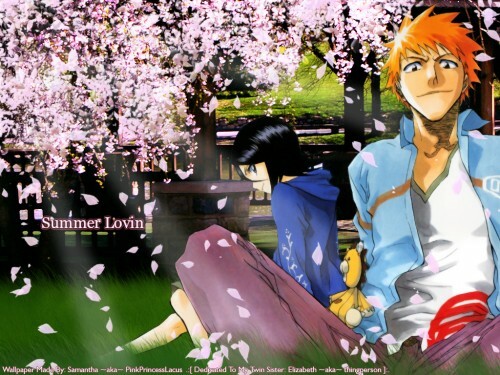 Minitokyo »	Bleach Wallpapers » Bleach Wallpaper: Summer Lovin . :[Dedicated To My Twin Sister: thingperson ]:. This is my newest wallie, and its of one of my favorite shows Bleach, and couples ever Rukia and Ichigo!. I used a stock in the background, I had three different versions of this stock on top of each other and two on different blend modes and on one of them had to erase some parts to make it fit in, and added a filter to it as well. I changed the levels and color balance of hue of them. I also brushed more Sakura pedals on the wallpaper because I just love them so much and added to some of them a Paint Daubs filter to it to match the stock more, with some layer styles on them to, then had them falling down on Rukia and Ichigo in the breeze. The grass is what was so hard for me. It was my first time making grass and I had 14 different layers of it with different colors, and blends. It took me forever (or what felt like forever) to extract the scan. I made the lighting source rays in it, and I made the pedal brush. Grass brushes used were from Deviantart. My sister of whom this wallpaper is dedicated or a present to is thingperson, she helped me on this with her opinions on it as well, (though she does not know yet this is for her so shhhhh ;) lets wait until she reads it to find out *hehe*), I dedicated to her because I love her so much and that she is the best sister anyone in the world could ask for!. My best friend Starr once again helped me on the text part *hehe* Im so bad with that :D.
Oh i love this so much..really the scan is so pretty..and i love the background with the flowers and everything you are so talented..really...wow i love this sam thank you so much for dedicating it to me..hehe..and your right it took me 5 minutes to figure out it was dedicated to me..hehe...you know me to well..hehe..thank you so much sam..*hugs*. Nice job! The scenery is wonderful and the characters are great! It would have looked a little bit more realistic if the grass was coarser, but that might just be the thumbnail. lol! That One nice wallie! I like to think of them as a couple too...But people are also talking about Orihime, But it doesn't worry me! You sure put a lot of effort into it!I don't think I could do anything as good as this in years to come! Thanks 4 the hard work! looking forward to more! this is a really good wallie! this is the best wallie u've ever made :D ! Yey, sakura trees ... I love those ! :D Where do you find the time and inspiration to make all these wonderful wallies ?! *amazed and impressed look* Whao, this really is a pretty one, my love. Hehe, I love the grin on Ichigo's face. The bg is breathtaking ... gosh that must've taken ages to make it, but you can clearly see all the time, sweat and nerve breaking you've put in it ! Anyway, another great wall by the greatest person in my life ! *smiles with a blush* Must add ya both to my favs ... oh wait, you already are *hugs with a wink* *clickey on the favie button* THUMBS UP ! You got me ! Ah,... i must say, it is worth ever bit of a dedication and surpise. :) Back here. Hrm... i love the petals and grass as well as the Wood work. Hmmmm! :)It's a gorgeous blend. Simply put. Great wall, and the background looks amazing. Nice job. Love this pic it is so great. and it is so sweet that you dedicated it to your sister. but the whole blossoms drifting in the wind is so beautifull and soothing which sets the mood for the piece. keep up the good work ;) . thanx for sharing the pic. Aaaahhhh Ichigo and Rukia, the best Bleach couple ever ! Your wall is great, looks very peaceful. I really like the light and the sakura tree. Thx !